Zermatt, Switzerland, home of the Matterhorn (pictured at right) is about 40 miles from Sion in the southern region of Switzerland (see map below) and is the only place in Switzerland that I’ve always left wishing I had more time to stay because there is so much to see and do. Although there is an airport in Sion, most international flights arrive in and depart out of Geneva or Zurich because weather conditions can change so rapidly in this mountainous region. 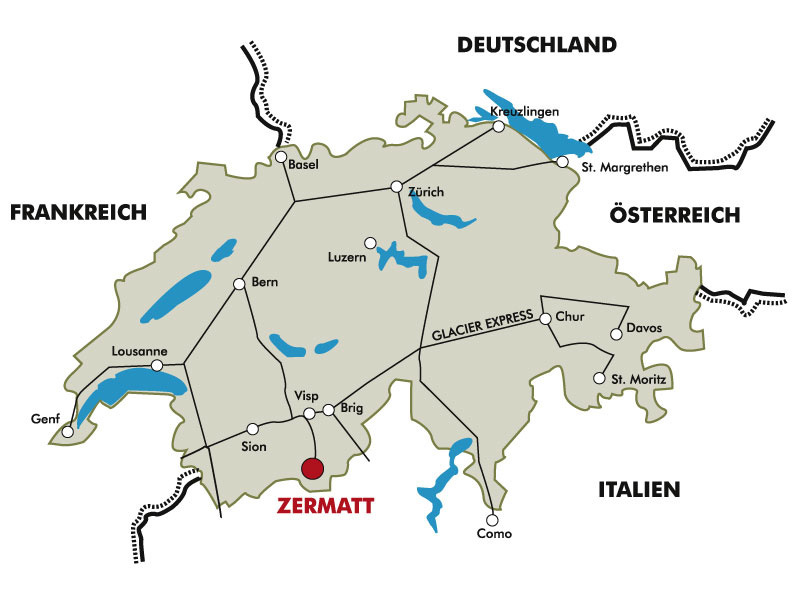 Accessible by car or train (preferable), Zermatt is 140 miles or 230 kilometers from Geneva or Zurich in the Canton of Valais, close to the Italian border, which must be why I’m drawn to Zermatt. The “I’m going to enjoy my life” mentality seeps across the border and inhabits the Zermattians and those that visit even though this area is a German-speaking part of Switzerland (Note: There is a pecking order in Swiss culture and although all of Switzerland is quite rigid, the Swiss Italians are by far the most laid back group in the country. The Swiss Germans look down upon the Swiss French as inefficient and both the Swiss German and Swiss French agree that Swiss Italians border on being inefficient fun-loving fools). Zermatt is most famous for the Matterhorn (pictured below), one of the highest peaks in the Alps at 14,600 feet (4,478 meters). Although the Matterhorn looks like a lone ranger, there are 37 other mountains that have peaks in excess of 13,000 feet (4,000 meters) so Zermatt is considered a mountain climber’s paradise. The village of Zermatt is at 5,310 feet (1,620 meters) and in a valley with the surrounding accessible five peaks by railway or gondola ranging from a low of 7,506 feet (2,288 meters) at Sunnegga to a high of 12,740 feet (3,883 meters) at the Matterhorn Glacier Paradise. Consequently, Zermatt lays claim to 365 days of skiing although summer skiing is limited to the Matterhorn Glacier Paradise. Zermatt is a small charming village in a deep valley (as shown below) and next to the River Vispa. Vehicles with engines are prohibited and instead there are electric buses, battery operated vehicles, and horse-drawn carriages to minimize pollution and allow pedestrians to walk (somewhat) freely through the streets. The village is condensed and although a bit hilly in areas, easy to explore. 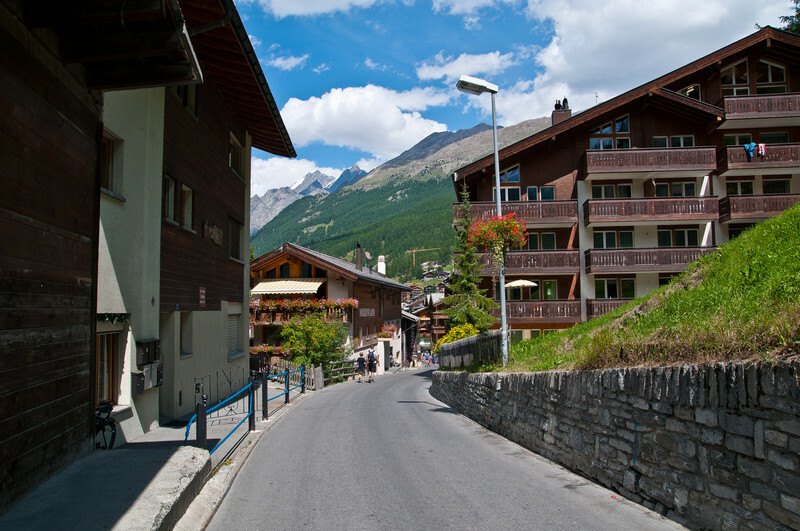 The alpine chalet style buildings have a multitude of shops and restaurants at street level. Zermatt has an abundance of sporting good stores filled with high quality clothing and equipment as this town caters to the outdoor enthusiast. 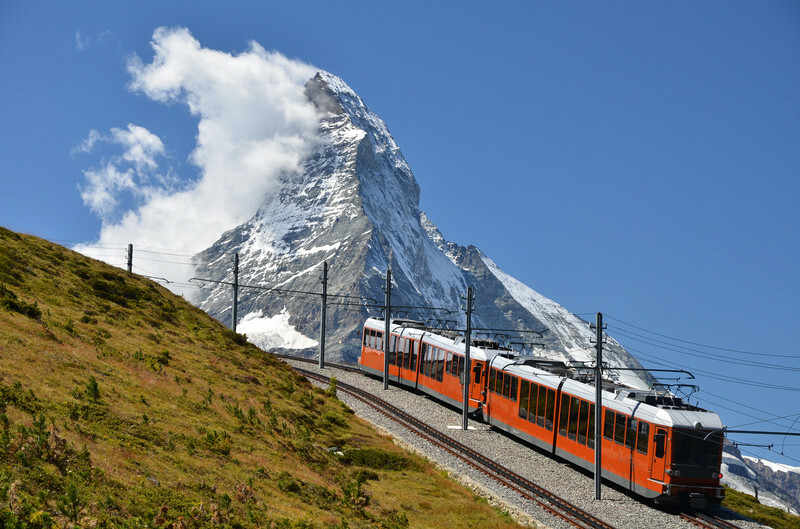 Zermatt has a central train station in the village which makes travel to the peaks and neighboring areas very easy. The transportation system serving the area is designed to expand the use of the mountains beyond skiers and to encourage walkers, hikers, snowshoers, and others to explore the accessible peaks. 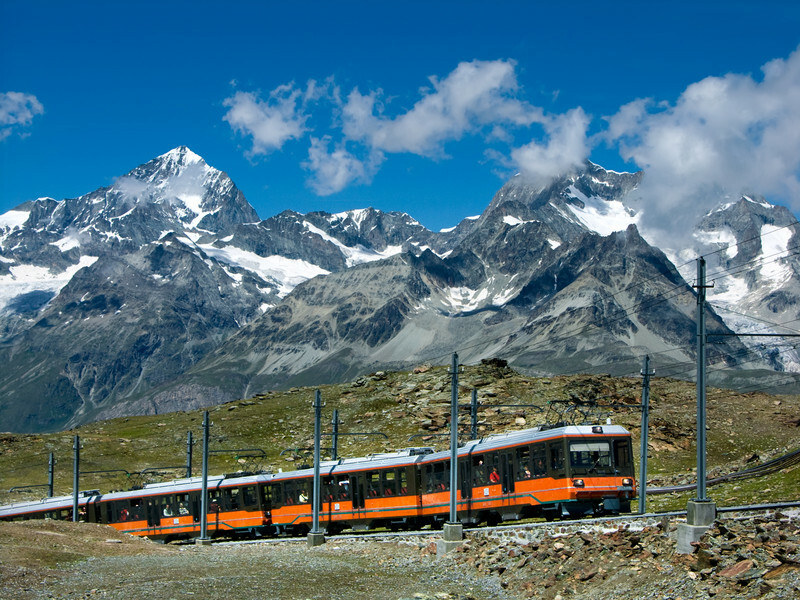 One of the most famous railway lines is the rack railway called the “Gornergratbahn” (shown below) to the summit of the Gornergrat at 10,140 feet (3,089 meters). At the top of the Gornergrat, there is a spectacular view of the Matterhorn (as illustrated below).For those that want to go even higher (12,740 feet), take the Matterhorn Express gondola up to the Matterhorn Glacier Paradise where there is a restaurant, a shop and even hotel rooms, albeit basic. Be aware of the altitude and use caution, especially if you have been at lower altitudes. 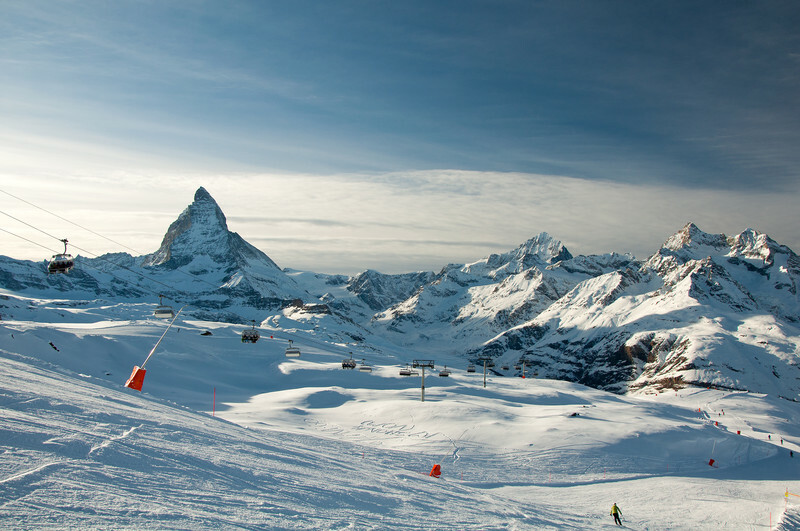 Zermatt is a sports lovers mecca with golf, tennis, river rafting, mountaineering and climbing, tobogganing, sledding, fly fishing, ice hockey and more. There is never a day in Zermattwhen there isn’t a choice of sports to participate in and that is one of the main reasons Zermattis a destination spot for many tourists. For detailed information on winter and summer sports, go to www.zermatt.ch. 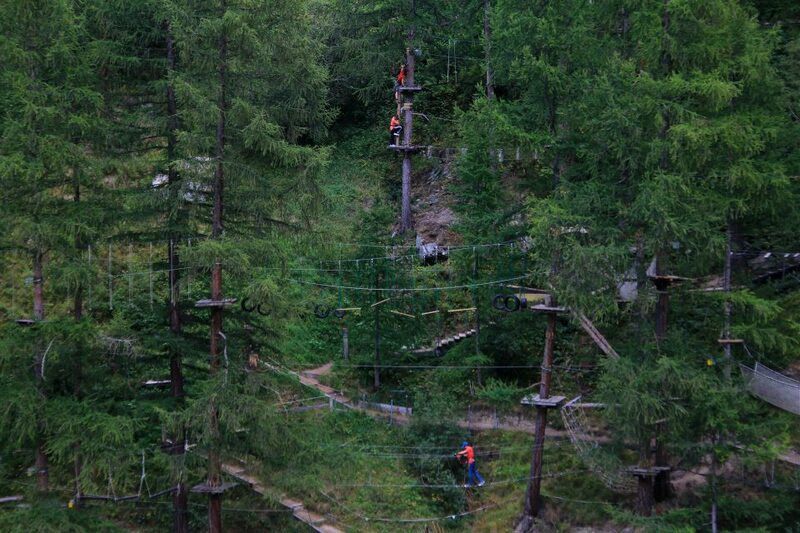 The Forest Fun Park is an outdoor adventure park that is enjoyed by both kids and adults. My daughter especially enjoyed spending an afternoon here as she could step, swing, climb, and zip line from tree to tree. The park has courses for kids as young as 4-7 years. Course difficulty is signified by color with green the easiest followed by red and then black. For complete information, go to www.zermatt-fun.ch. 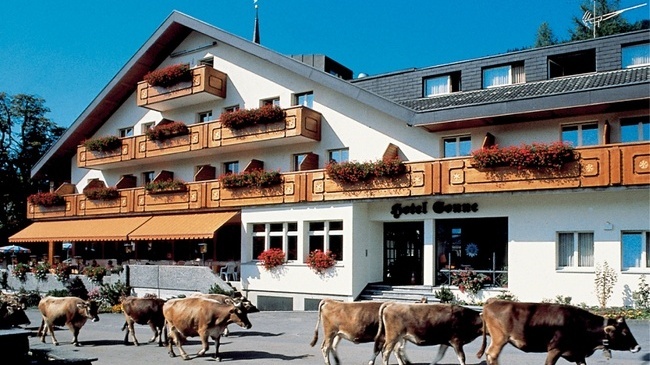 There are more than 150 hotels in Zermatt and the most informative website is www.zermatt.ch. My criteria for booking a hotel included a central location in the village that was kid and pet friendly because we traveled with our dog. We enjoy the Hotel Sonne where we were greeted by the owner’s golden retriever at the front door and our dog was greeted as enthusiastically as any hotel guest. 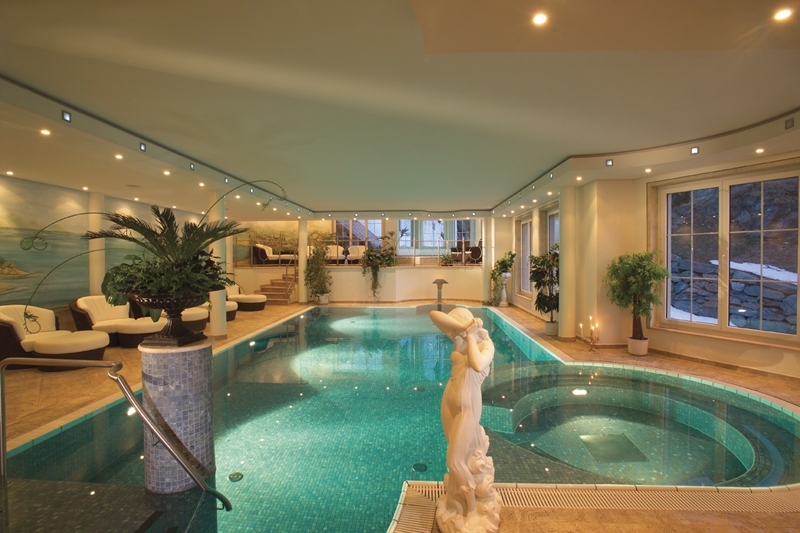 The hotel has a large indoor heated swimming pool, a sauna, and a spa. The elevator is small (but aren’t all European elevators small?) and so we almost always took the steps but the room was large and the views spectacular. The hotel is family owned and operated. Breakfast was a huge buffet with a strong Swiss emphasis: cheese, meat, yogurt, fruit, muesli, assorted breads and juices. Dinner is also served at the hotel and even though we arrived after serving hours (which can be quite rigid in Switzerland), they sensed our exhaustion and offered to cook up dinner, which we happily accepted. Zermatt has a wide variety of restaurants which can be viewed by category (Italian, Swiss, Asian, Vegetarian, etc) at www.zermatt.ch. A friend highly recommended “Ristorante Capri” – an Italian restaurant in the Mont Cervin Palace Hotel (www.seilerhotels.ch) at Bahnhofstrasse 31 which is in the central part of the village, but with our large group that included four hungry kids, we decided to take a more casual route and eat at Ristorante Molino– a large Italian restaurant in the center of the town that was willing to seat our large group right away. Best described as a casual pizza and pasta place, Molino provided quick service which pleased the group. 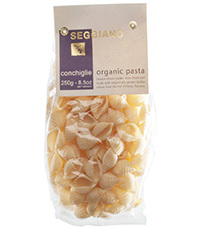 Ristorante Molino is a chain and has 18 locations in throughout Switzerland. 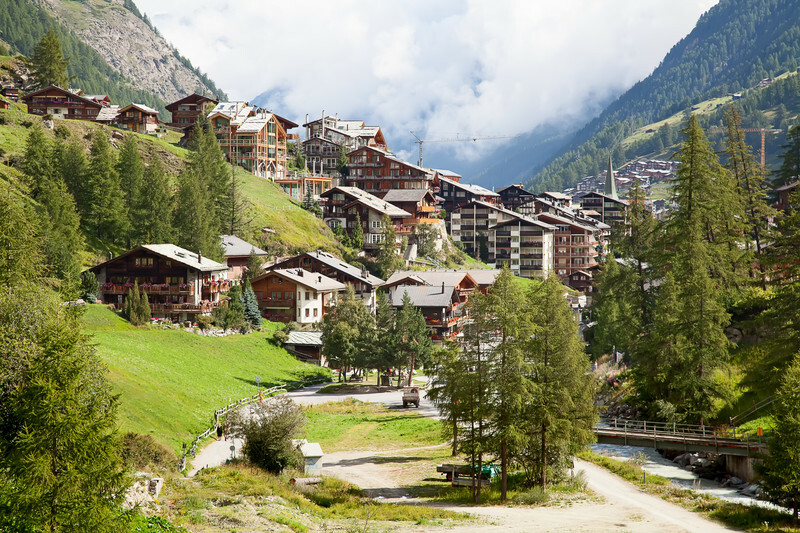 Zermatt is a casual and an outdoor sports lovers paradise that begs for return visits.